WASHINGTON: They might be the odd couple of the bird world. Scientists on Thursday identified the closest relative of New Zealand's famed kiwi, a shy chicken-sized flightless bird, as the elephant bird of Madagascar, a flightless giant that was 10 feet (3 meters) tall and went extinct a few centuries ago. The surprising findings, based on DNA extracted from the bones of two elephant bird species, force a re-evaluation of the ancestry of the group of flightless birds called ratites that reside in the world's southern continents, they added. The group, which boasts some of the world's largest birds, includes emus and cassowaries in Australia, rheas in South America, ostriches in Africa and kiwis in New Zealand. Ratites that have disappeared in recent centuries include the moa of New Zealand and the elephant bird. 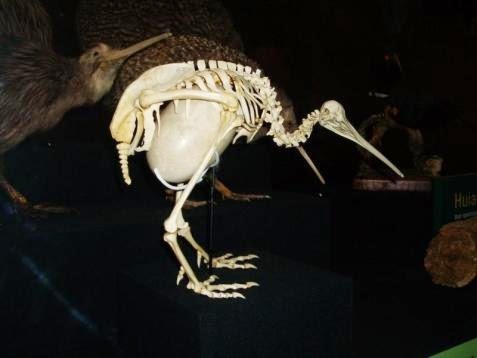 The researchers compared elephant bird DNA to the other birds and saw a close genetic link to the kiwi despite obvious differences in size, body shape and lifestyle - and the fact they lived about 7,000 miles (11,500 km) apart. The largest elephant bird species weighed more than 600 pounds (275 kg). Kiwis reach around 11 pounds (5 kg). There has been a lively debate among bird experts about the origins of the ratites and how they came to live where they do. The world's first birds arose about 150 million years ago. Over the eons, some species lost the ability to fly but became large and formidable. Many scientists have thought the ancestors of today's ratites were already flightless when they were isolated in their current locations by the separation and drift of the southern continents over the past 130 million years. The new findings indicate the continents had already separated before ratite ancestors showed up, meaning the forebears of these flightless birds reached their current homes by flying. "It does seem a little ironic, but in fact it's the simplest explanation for the facts we observe," said Kieren Mitchell of the University of Adelaide's Australian Centre for Ancient DNA. Alan Cooper of University of Adelaide said the new data suggest that flying ratite ancestors dispersed around the world right after the mass extinction killed the dinosaurs 65 million years ago and before mammals became dominant. Mitchell said the researchers had expected to find that the elephant bird and ostrich were the most ancient lineages of ratite because Africa and Madagascar were the first landmasses to separate from what had been an ancient super-continent. Instead, they found that elephant birds and kiwis arose from a common ancestor around 50 million years ago after even New Zealand had become isolated. Previous research had suggested Australia's ratites as the kiwi's closest relatives. "If the common ancestor of kiwi and elephant birds lived on Madagascar, then kiwis must have flown to New Zealand. If this ancestor lived on New Zealand, then elephant birds must have flown to Madagascar," Mitchell said. "Or perhaps the common ancestor of both elephant birds and kiwis flew to their final locations from somewhere else entirely."